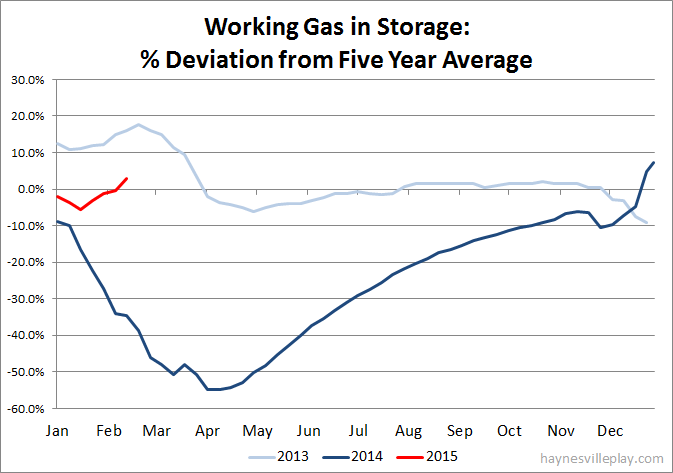 The EIA reported that working gas in storage was down 111 Bcf last week to 2.157 Tcf. The weekly withdrawal was 55% below last year (-247 Bcf) and 38% lower than the five year average (-180 Bcf). The current storage level is now 45.8% higher than last year (1.479 Tcf, a difference of 678 Bcf) and 2.8% above the five year average (2.099 Tcf, a difference of 58 Bcf). This marks the first time since November 29, 2013 that the current level has been higher than the five year average. Temperatures last week in the Lower 48 averaged 38 degrees,which was 12.3 degrees warmer than last year and 2.6 degrees warmer than average. The only analogy I come up with is that the Marcellous Shale has a lot of rigs working and they are still working on HBP drilling... Therefore, more gas hitting the system etc. Do you have any thoughts on these last few withdraws? I was thinking 200 BCF plus for the last two weeks. 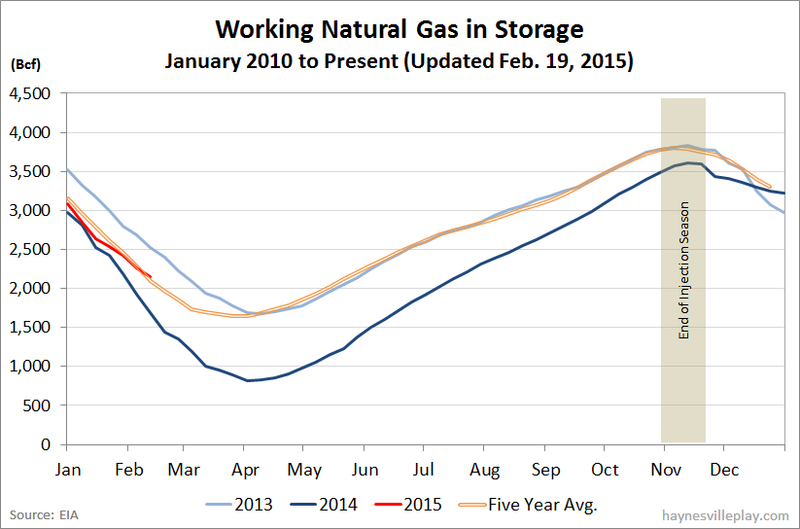 The EIA storage report is a week delayed, so this week's data reflects last week's conditions. The weather last week was a scorcher for February, 12.3 degrees warmer than last year and 2.6 degrees warmer than average. Production numbers are higher than last year, so the weather really needs to keep up :-) to keep storage down. Now that I've had the chance to post the temperature map from last week, you can see that it was particularly warm, especially in the Midwest and Rockies. The Marcellus has been the big driver of gas production. HBP is part of the issue. Also there is new pipeline capacity being added, which increases the flow. Next week should be a good withdrawal, but it's going to take some more cold weather to be able to hit 1.5 Tcf at the end of the season. It's doable, but not with the recent inconsistency with the weather.